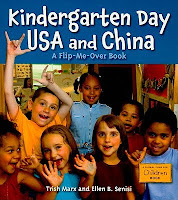 Kindergarten Day, USA and China: A Flip-Me-Over Book by Trish Marx and Ellen B. Senisi. Ages 4-6. Charlesbridge, July 2010. Unpaged. Review copy provided by publisher. It's 9:00 in the morning and time to start a new day at kindergarten! And halfway across the world, it's 9:00 in the evening and kindergarteners in China are going to sleep. Kindergarten Day, USA and China takes a look at one day in an American kindergarten. Flip the book over and you can take a look at one day in a Chinese kindergarten! Each spread covers an hour (or so) in a kindergarten class. We see kids learning to read, drawing pictures, playing outside, having lunch, celebrating a classmate's birthday, dealing with problems, and practicing telling time. A small clock at the bottom of the page shows the time (in America and in China) as we go through the day. The overview of the day is necessarily brief, touching on just a few things that kindergarteners do. When we take a look at the Chinese side of the book, we find that Chinese kids do the same things as American kids. They read stories, play outside, celebrate birthdays, etc. A few Chinese words and characters are included on each spread of the Chinese side. As the start of school draws near, librarians are sure to be reaching for the back-to-school books and this one will fit the bill with a nice multicultural aspect. The book will reassure kids just starting school with a clear depiction of some of the things they'll be doing. The book clearly comes down on the side of "We're all the same! ", which is nice, but I would have liked to see more of the cultural differences between the two classes. Still, this book will definitely have an audience and we can always use more back-to-school titles. 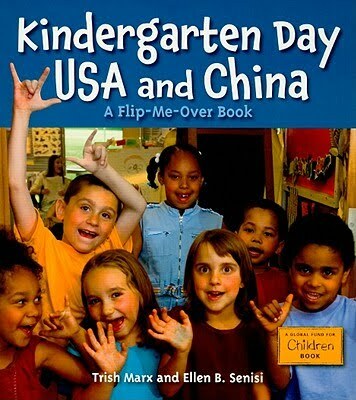 Kindergarten Day, USA and China is on shelves now! Pick it up and add it to your back-to-school displays. And happy Non-Fiction Monday! Head on over to Three Turtles and Their Pet Librarian for this week's roundup!